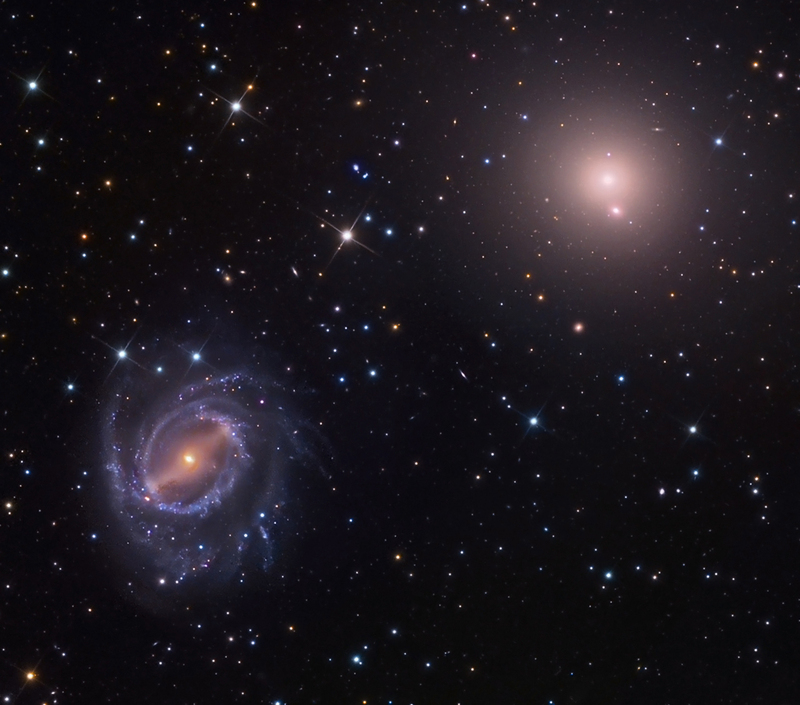 NGC 5846 is the elliptical galaxy at upper right and NGC 5850 is the spiral galaxy . NGC 5850 is classified as SBa-b and is a barred intra-ring galaxy that suffered a high speed encounter with NGC 5846. This galaxy, a member of the NGC 5846 galaxy group, has a very well-defined bar and inner ring . The nearly face-on orientation indicates that the inner ring is intrinsically elongated along the bar axis. The two main outer arms show a partial outer ring morphology, but a third arm, like a lone ``plume" The bar is striking for its lack of leading dust lanes , but weak lanes are seen around the center. In this region, there is a small nuclear ring crossed by a strong secondary bar whose major axis is aligned nearly perpendicular to the primary bar . The B-V color index map shows that the inner ring is dominated by recent star formation, while the apparent nuclear ring is unusually quiescent. Except for two weak arcs of dust, there is no color contrast in this area of NGC 5850 .